Cross LOC (Line of Control) trade initiative has been one aspiring development which has been lingering around for a while now. India and Pakistan still haven’t realised that it is one of the most sought after CBM’s one could ask for, besides phased demilitarisation, that could gesticulate some sort of optimism towards the Kashmir resolution. 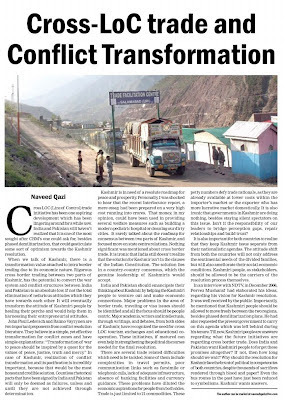 When we talk of Kashmir, there is a transformational value attached to intra border trading due to its economic nature. Rigorous cross border trading between two parts of Kashmir, has the potential to convert the war system and conflict structures between India and Pakistan to an absolute low, if not the total elimination of nefarious attitudes which they have towards each other. It will eventually transform the attitude of Kashmiri people by healing their psyche and would help them in harnessing their entrepreneurial attitudes. John Paul Lederach and Raimo Vayrynen are two important proponents from conflict resolution literature. 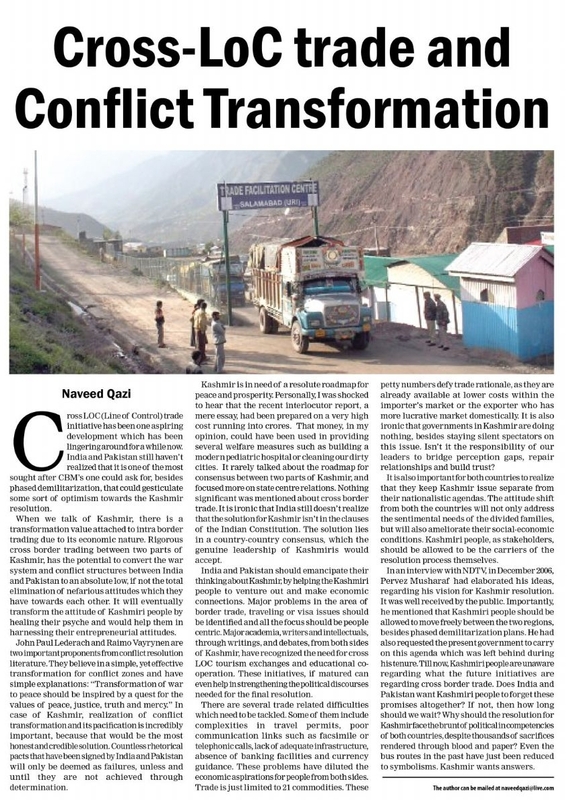 They believe in a simple, yet effective transformation for conflict zones and have simple explanations: “Transformation of war to peace should be inspired by a quest for the values of peace, justice, truth and mercy.” In case of Kashmir, realisation of conflict transformation and its pacification is incredibly important, because that would be the most honest and credible solution. Countless rhetorical pacts that have been signed by India and Pakistan will only be deemed as failures, unless and until they are not achieved through determination. Kashmir is in need of a resolute roadmap for peace and prosperity. Personally, I was shocked to hear that the recent interlocutor report, had been prepared on a cost of Rs. 50 crore. That money, in my opinion, could have been used in providing several welfare measures such as building a modern pediatric hospital or cleaning our dirty cities. It rarely talked about the roadmap for consensus between two parts of Kashmir, and focused more on state centre relations. Nothing significant was mentioned about cross border trade. It is ironic that India still doesn’t realise that the solution for Kashmir isn’t in the clauses of the Indian Constitution. The solution lies in a country-country consensus, which the genuine leadership of Kashmiris would accept. India and Pakistan should emancipate their thinking about Kashmir, by helping the Kashmiri people to venture out and make economic connections. Major problems in the area of border trade, traveling or visa issues should be identified and all the focus should be people centric. Major academia, writers and intellectuals, through writings, and debates, from both sides of Kashmir, have recognised the need for cross LOC tourism exchanges and educational co-operation. These initiatives, if matured can even help in strengthening the political discourses needed for the final resolution. There are several trade related difficulties which need to be tackled. Some of them include complexities in travel permits, poor communication links through facsimile or telephonic calls, lack of adequate infrastructure, absence of banking facilities and currency guidance. These problems have diluted the economic aspirations for people from both sides. Trade is just limited to 21 commodities. These petty numbers defy trade rationale, as they are already available at lower costs within the importer’s market or the exporter who has more lucrative market domestically. It is also ironic that governments in Kashmir are doing nothing, besides staying silent spectators on this issue. Isn’t it the responsibility of our leaders to bridge perception gaps, repair relationships and build trust? It is also important for both countries to realise that they keep the Kashmir issue separate from their nationalistic agendas. The attitude shift from both the countries will not only address the sentimental needs of the divided families, but will also ameliorate their social-economic conditions. Kashmiri people, as stakeholders, should be allowed to be the carriers of the resolution process themselves. In an interview with NDTV, in December 2006, Pervez Musharaf had elaborated his ideas, regarding his vision for Kashmir resolution. It was well received by the public. Importantly, he mentioned that Kashmiri people should be allowed to move freely between the two regions, besides phased demilitarisation plans. He had also requested the present government to carry on this agenda which was left behind during his tenure. Till now, Kashmiri people are unaware regarding what the future initiatives are regarding cross border trade. Does India and Pakistan want Kashmiri people to forget these promises altogether? If not, then how long should we wait? Why should the resolution for Kashmir face the brunt of political incompetencies of both countries, despite thousands of sacrifices rendered through blood and paper? Even the bus routes in the past have just been reduced to symbolisms. Kashmir wants answers.